The sad and tragic truth: Dr Ionescu is above the law. Khairulanwar Zaini. The seeming lack of justice in the aftermath of the tragic hit-and-run accident involving a Romanian embassy car on 15th December 2009, which has left one person dead, has triggered much public outrage, with Singaporeans lobbing vehement criticisms against the Singapore government for its perceived inaction and inefficiency. This has been compounded by the recent testimonies from other eyewitnesses explicitly contradicting the account of the Romanian charge d’affaires, Dr Silviu Ionescu, who was said to be in the vicinity of the abandoned vehicle, although he has denied any culpability in the accident. Dr Ionescu is currently in Romania for medical treatment, although he has promised to return in late January to assist with the investigations. 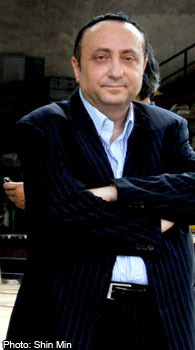 Nevertheless, the Singapore government has come under much flak for permitting Dr Ionescu to leave in the first place. This antipathy is an overspill from the backlash against the government’s lax immigration policies – in allowing a suspect in a hit-and-run to leave the country, the government was once again construed to be prioritising foreign interests over domestic ones. Yet some of this anger is mis-directed. The fact is that the government’s pursuit of Dr Ionescu is circumscribed by the latter’s enjoyment of diplomatic immunity under the Vienna Convention on Diplomatic Relations. Any prosecution can only be undertaken with the expressed consent of the Romanian government. The sad and tragic truth: Dr Ionescu is above the law. 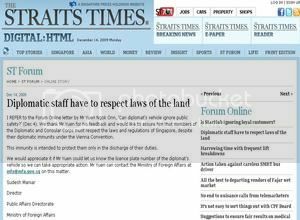 This double standard in applying Singapore laws is neither motivated by bilateral diplomatic considerations nor succumbing to international pressure – it is a binding legal obligation. Going by the conventional interpretation of the treaty that provides a wide mandate for diplomatic immunity, Dr Ionescu is impervious to any criminal proceedings. With Dr Ionescu safely cocooned by international laws and norms, the only recourse available to the government is to request for Romania to waive his legal immunity if the investigations do yield enough evidence to prosecute him. If Romania declines so, the furthest Singapore could do is to declare him as a persona non grata, short of escalating the situation by recalling our ambassador. 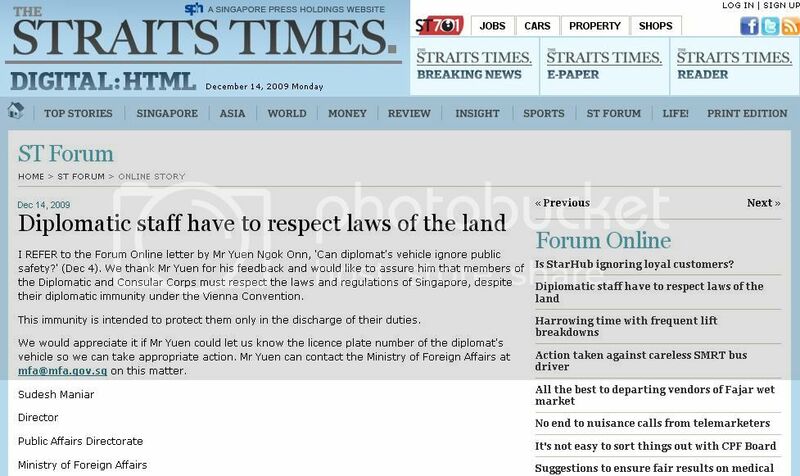 Written as a Straits Times Forum response to allegations of traffic violations by consular staffs (see picture right), it suggests that ‘immunity is intended to protect them only in the discharge of their duties.’ However, while diplomatic missions are expected to observe the laws of their host countries, they do so not out of compulsion, but as a matter of diplomatic politeness. The host government does not have any powers of legal enforcement, even in the grossest of transgressions, although it could wield its powers of persuasion. It is a pity, in having to depend on moral suasion over legal argument to convince Romania to grant a waiver, that the Singapore government has hobbled itself by outlawing cause-based assemblies. Such an incident in any other country would have been a cause célèbre inviting protests in an embassy’s vicinity. Hence, in denying even peaceful protests and any public expression of discontent, the government is unable to insist on a waiver in the name of public pressure and outrage. Singapore is certainly poorer as a result, but this escapes the crux of the matter: that Romania has the prerogative to waive the immunity to allow prosecution if investigations do yield Dr Ionescu as the prime suspect. The online public petition, addressed to the Romanian embassy and government, is a step in the right direction – by aiming at the very agency that has the legal power to drive proceedings into motion. It is certainly heartening to note that Dr Ionescu has agreed to return to Singapore in late January to assist the police, although the exigency of the situation and the gravity of the crime would call for Dr Ionescu to return post-haste. Surely, Dr Ionescu has enough confidence in our medical facilities’ capacity to fulfil his medical needs. The Romanian government could also do no wrong in providing ex-gratia payments to the victims, since its vehicle was indeed involved in the accidents. Although it might be construed by some as an admission of guilt in the interim, this action will be hailed as a gesture of Romanian goodwill and generosity if the investigations do prove Dr Ionescu innocent. Hence, despite him being above the law, this cause is not unduly futile: Dr Ionescu could be brought down with sufficient public moral outrage and pressure. It is very anomalous, with the tendency of international laws and norms gravitating towards the validation of human rights and the rule of law, for diplomats to be endowed with such fortuitous legal entitlements. The notion of diplomatic immunity could use a few refinements. The spirit of preventing governments from shooting the messenger is laudable, but instances of abuses should compel governments to revise the terms. It will be tricky, it will be difficult, it will be arduous – but it is nonetheless necessary to ensure that the rule of law and the respect for human life can and will be upheld and observed for all, diplomats and the common man alike.